Written with former U.S. Senate Democratic Leader Tom Daschle; a Washington Post bestseller. 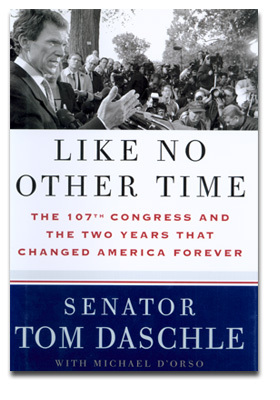 From Publishers Weekly: South Dakota Senator Daschle's account of the 107th Congress recalls an unusually eventful time: congruent with President Bush's first two years in office, it featured the September 11 attacks; the anthrax contamination of the Senate's Hart Office Building generally, and Daschle's quarters specifically; and the dramatic switch of Vermont's Senator Jim Jeffords from Republican to independent, which gave Democrats control of the Senate and elevated Daschle to majority leader. For added measure, the first resolution supporting the planned war in Iraq was also passed in that Congress. Daschle conveys his insider view in a straightforward narrative offering unique insight into the political establishment's reaction to these events. Daschle's description of his frustrations with his Republican opponents provides a deeper understanding of 21st-century politics. Daschle's antipathy for House Speaker Tom DeLay is striking: "I find myself wondering," he writes, "how a person like Tom DeLay holds the power he does, while holding such extreme positions and taking such a heavy-handed approach to leadership." And Daschle expresses white-hot anger at President Bush, with his "Texas swagger," who launched his relationship with Daschle by saying, "I hope you'll never lie to me." Justified as this anger might have been, these examples make clear that Republicans and Democrats are divided by a deep and destructive fissure-a loss of bipartisanship that Daschle decries, and that, as he illustrates, devalues dissent and debate.